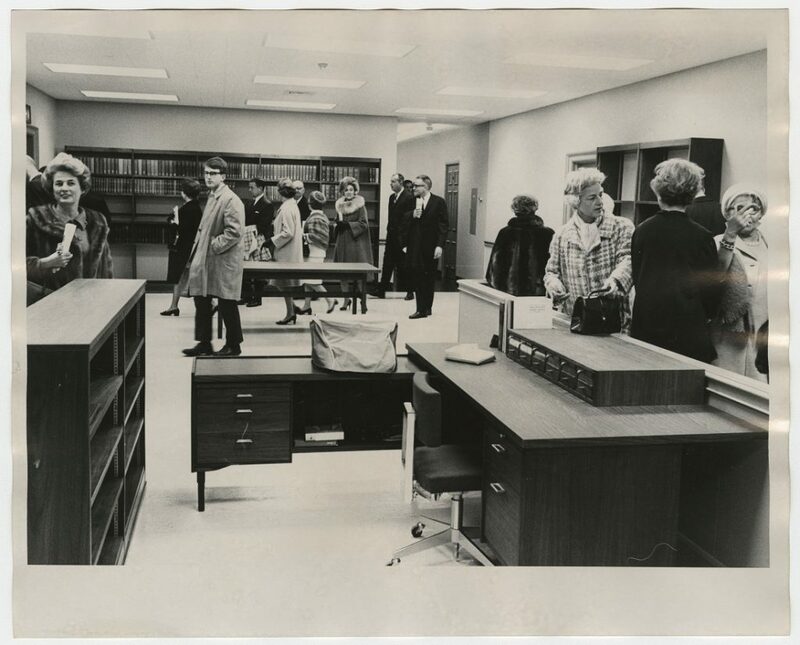 Fifty years ago today, the University of Kansas celebrated the dedication of the new Kenneth Spencer Research Library. It was the culmination of a project that had started over seven years earlier, and the result of a year of intensive planning by KU Libraries, multiple other campus units, KU Endowment, Helen Spencer, and the Kenneth A. and Helen F. Spencer Foundation. A buffet luncheon at the Kansas Union, noon to 1:30pm. 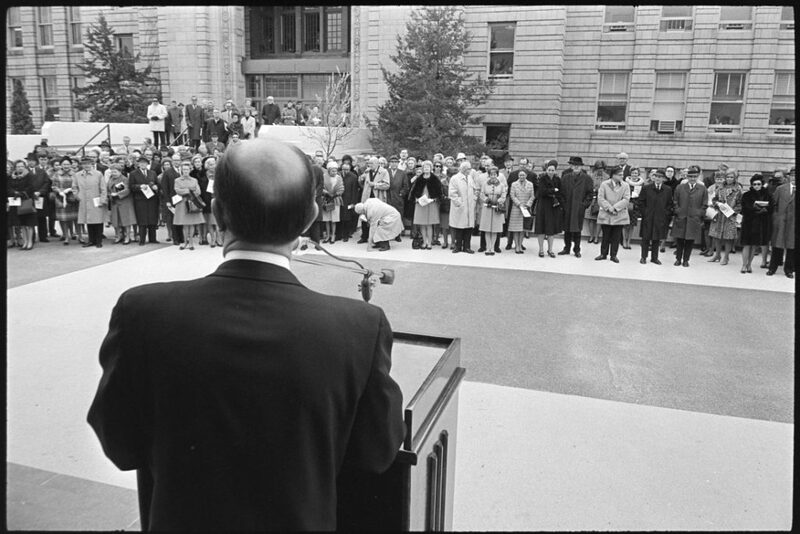 The private dedication ceremony for invited guests on the terrace at Spencer Research Library, 2:00pm. The public dedicatory lecture by Lord C. P. Snow, entitled “Kinds of Excellence: Education of the Gifted,” at Hoch Auditorium, 3:45pm. Describing the dedication ceremony, the University Daily Kansan student newspaper reported on November 11th that “about 270 persons braved 35 degree weather Friday to watch” the event. 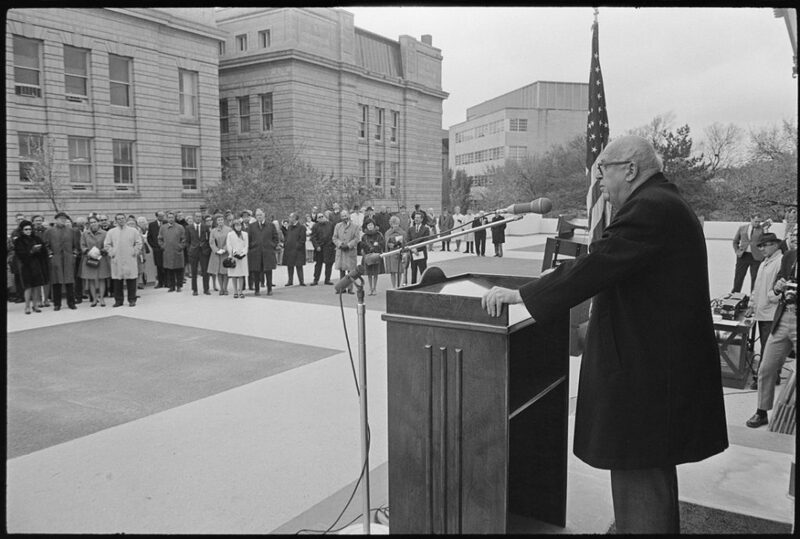 KU Chancellor W. Clarke Wescoe speaking at the dedication ceremony, November 8, 1968. Campus: Buildings: Spencer Research Library (Photos). Click image to enlarge. Next, Helen Spencer – speaking on behalf of the directors of the Kenneth A. and Helen F. Spencer Foundation – presented the library building to the University. It is truly gratifying to be here for this dedication. I appreciate so many of my dear friends coming today to share with me what I consider a significant occasion. Finally, he would have approved of this Research Library and the uses for which it is intended. As a business man and as a mining engineer, he was firmly convinced that growth of science-based industries in the Middle West could occur only with the aid of strong educational institutions capable of inspired teaching with facilities for forward-looking research in the sciences. 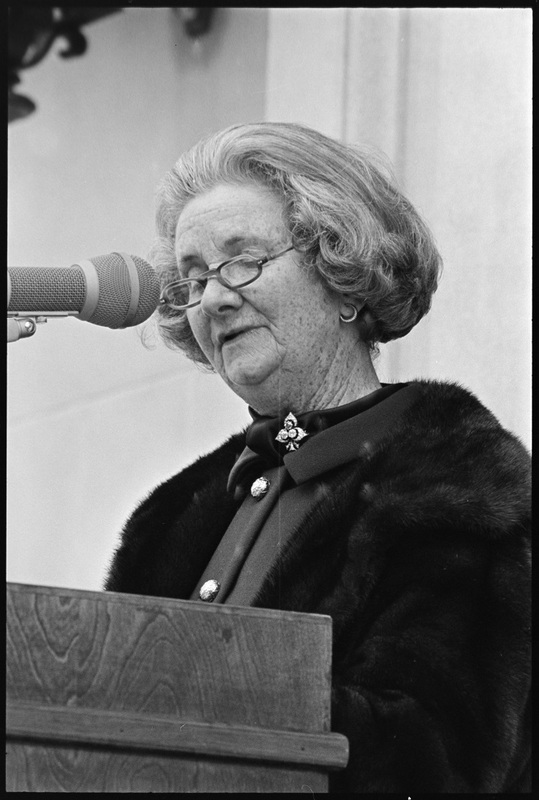 Helen Spencer speaking at the dedication ceremony, November 8, 1968. Charles N. Cushing, Chairman of the Kansas Board of Regents, replied and accepted the building on behalf of the Board of Regents and the University of Kansas. I am deeply honored to accept this magnificent building from a generous and most gracious lady. We know there are people with means, but we also know there are few people with vision. So first of all, I would like to pay tribute to a person who has such vision and who is responsible for the reality we dedicate here today. It is people like Helen Spencer who have made Kansas a great state. And it is generosity such as hers which has contributed immeasurably to the quality of this University she so deeply loves. And yet there is no person quite like Helen Spencer and, therefore, there is no gift quite like this one that has made this imposing structure possible. We stand in awe here today of the Kenneth Spencer Research Library. Far more than any other building on this campus it represents creative imagination. From its first concept to its final completion, it carries the imprint of a lady whose impeccable taste can be seen throughout–from the largest design to the smallest detail. For this building typifies those very qualities so dear to Mrs. Spencer’s ideals. It is only fitting and proper that this building bear the name of her late husband, the distinguished industrialist, Kenneth Spencer. A proud name for a proud building. And it will carry with it also the distinguishing characteristics of Kenneth Spencer’s life–quality–excellence–creativity. 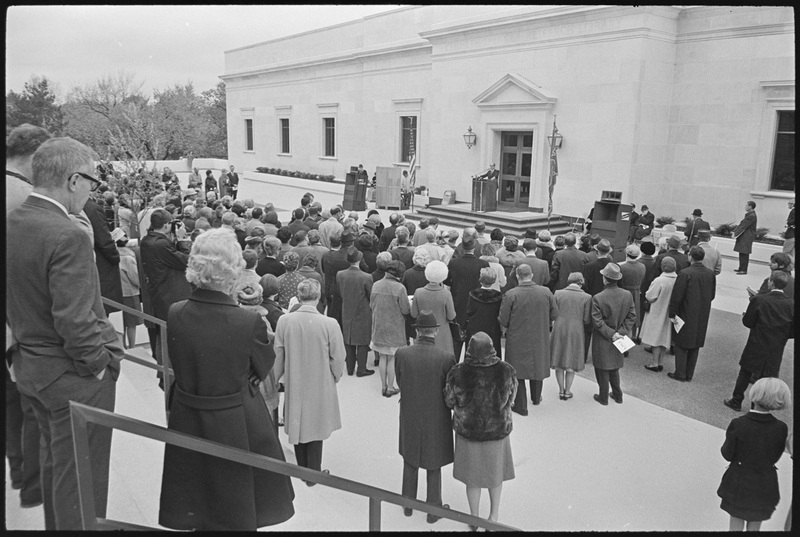 Through the years, the decades, and even the centuries to come, this building will long endure as a memorial–the building Helen Spencer built to honor her husband. But we must remember it is more than just a memorial–it is a means. It is a tool by which we may open the door to both the past and the future. And it will benefit not only those who use it, but all who profit by new knowledge, and that is all of us–everyone. So it is today that everyone is indebted to you, Mrs. Spencer, and we thank you more than words can express. 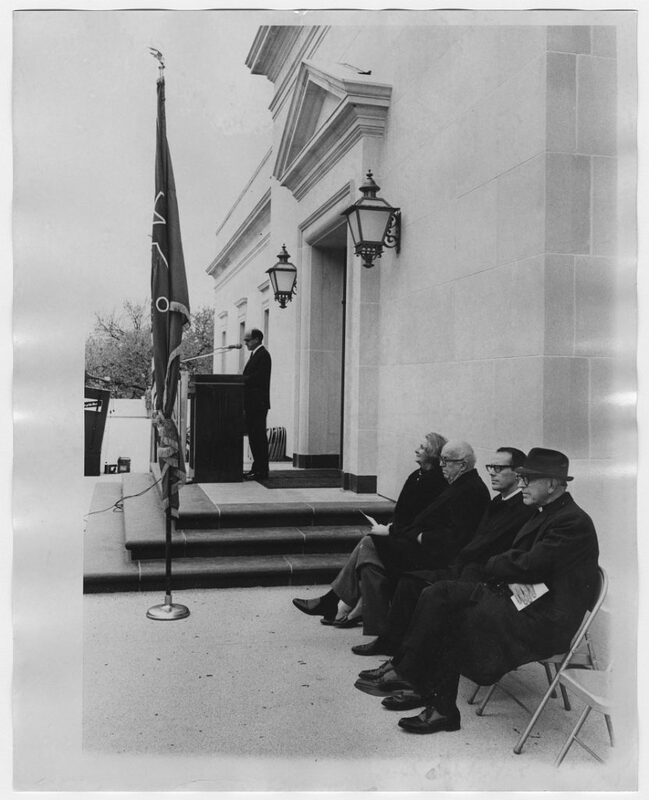 Lord C. P. Snow speaking at the dedication ceremony, November 8, 1968. Dr. Earle B. Jewell concluded the ceremony by reminiscing about Kenneth Spencer and providing the benediction. 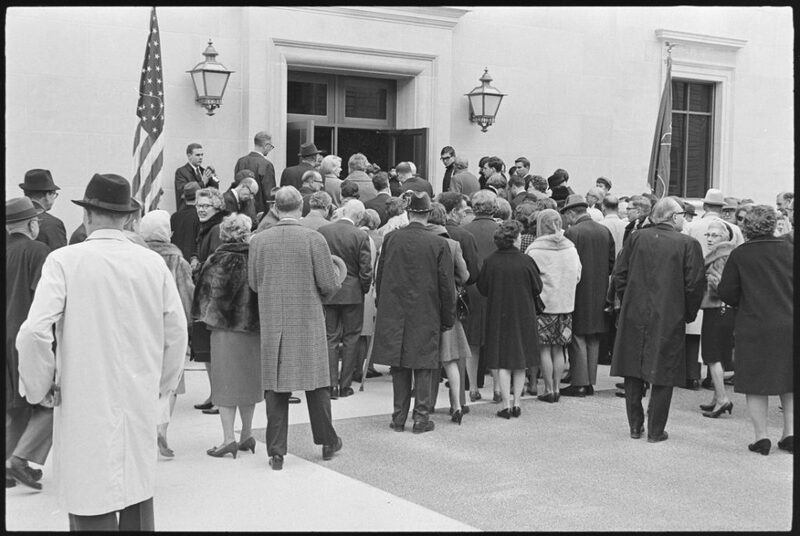 Guests entering the library after the dedication ceremony, November 8, 1968.
ceremony, November 8, 1968. This area is now the library’s Exhibit Space. Special Collections (Photos). Click image to enlarge.